Have you ever sewn with your eyes closed? Bobbinwork (sometimes called bobbin play because it is so much fun!) is a little bit like that because you don’t really see the final result until you stop sewing and turn the fabric over. You stitch on the wrong side of the fabric with heavy thread in the bobbin. 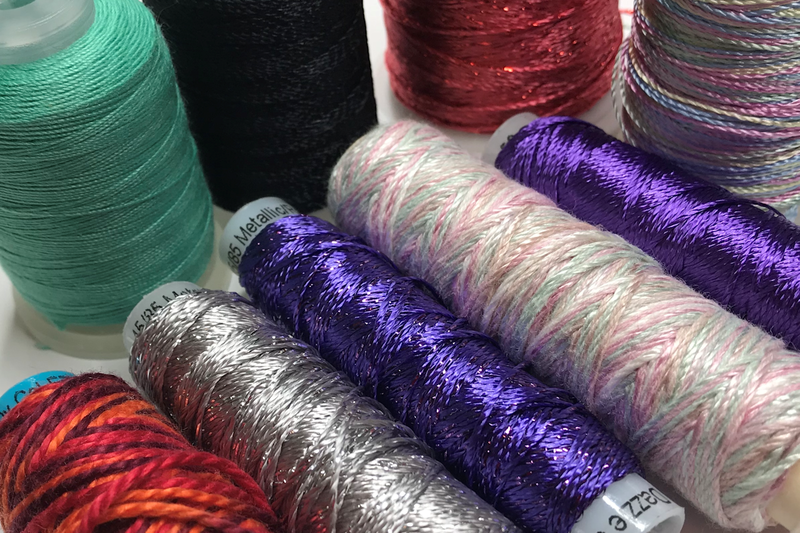 No wonder some people call it sewing “upside down!” Bobbinwork is a stunning way to add texture to your stitching, making bold and beautiful embellishments for all types of projects. 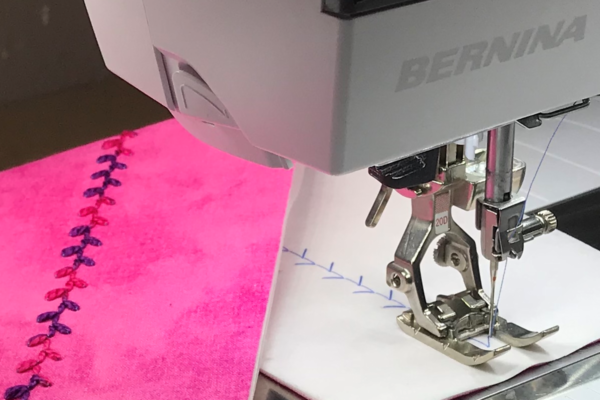 Decorative stitches from your machine as well as free-motion stitches will work for this technique on any BERNINA model. 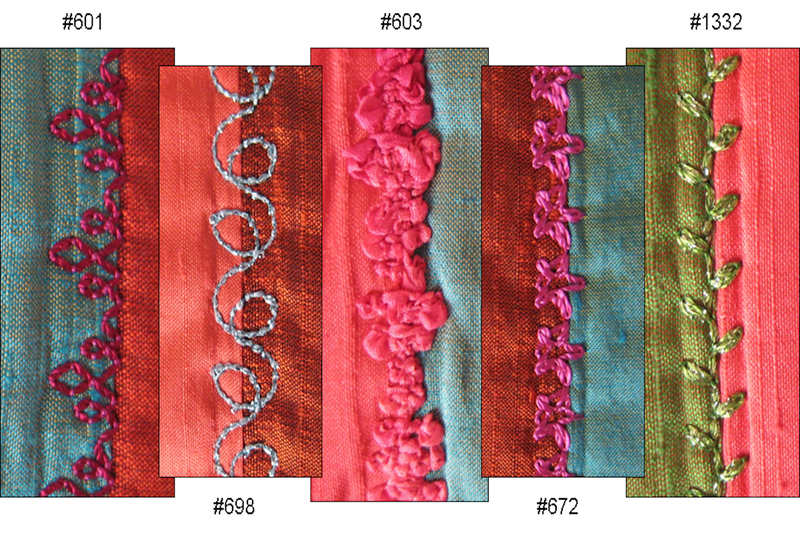 This post specifically shows decorative stitch bobbinwork for 7 and 8 Series machines. Heavy decorative threads are wound on the bobbin for bobbinwork. A 40-50 weight thread, usually in a matching color, is used in the needle. The BERNINA jumbo bobbin is really nice for bobbinwork because it holds more of the heavy threads, resulting in fewer bobbin changes. Decorative thread choices for bobbinwork are plentiful. Most thread companies have several options of heavy decorative threads in cotton, metallic, polyester, etc. You’ll know which threads are suitable for bobbinwork; just look for ones that are too large to go into the eye of the needle. The key to bobbinwork is finding the correct bobbin tension for the heavy thread you have chosen. We always been told not to change the bobbin tension. 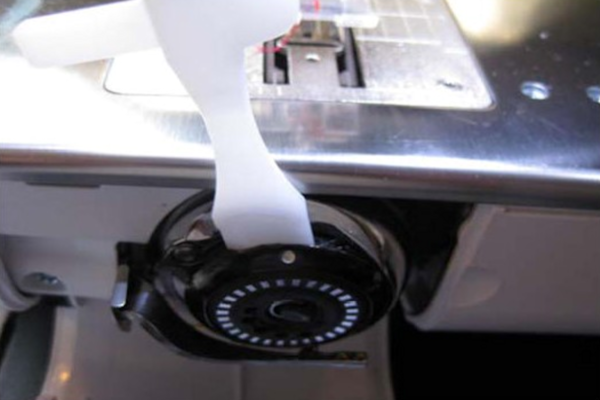 The reason for that is that it is factory-set for regular sewing thread and changing it is easy BUT resetting it correctly for sewing is not so easy. 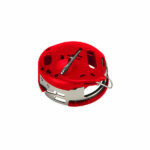 For that reason, it is recommended that you use a separate bobbin case for bobbinwork. 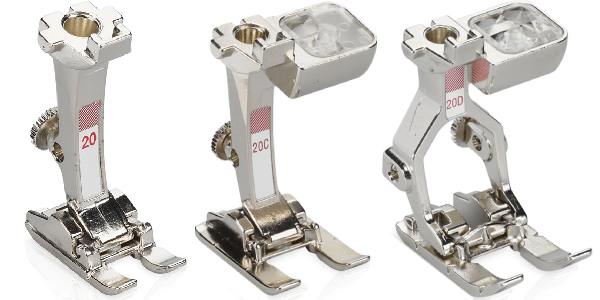 The BERNINA jumbo bobbin has a special case for bobbinwork. It’s easy to recognize because it is bright red! 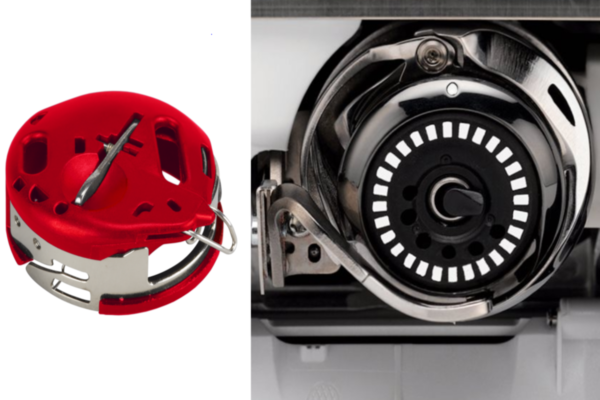 If you have an 8 series machine, no need to worry since the bobbin case is part of the machine. Your machine doesn’t require a separate case for any type of sewing. 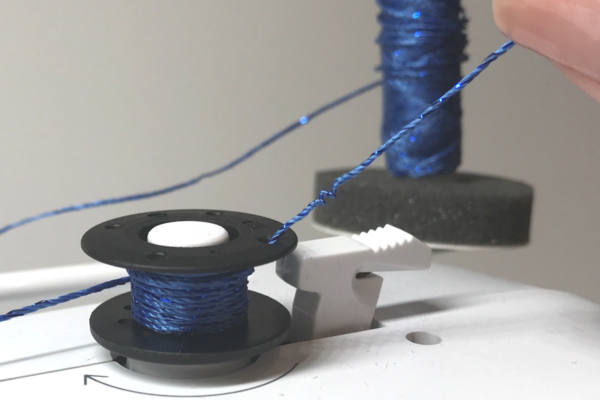 Most heavy decorative threads can be wound onto the bobbin in the same way as you do for everyday sewing with two differences. 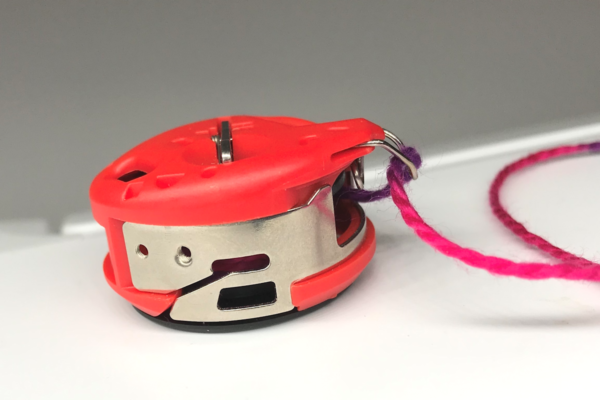 One is that the thread should be threaded up through the hole in the top of the bobbin when starting, you hold onto it as the winding starts and then, stop and trim it after a few revolutions before winding the bobbin full. The other difference is that the winding speed should be reduced so the heavy thread will not stretch and can wrap evenly around the bobbin. For flat ribbon-like cords, thin yarns, and very heavy threads, you should wind the bobbin by hand. Hold the bobbin with the silver side facing away from you and evenly wrap the yarn or cord around the bobbin, winding in a counter clockwise direction. The factory-set bobbin tension on the red bobbin case is set looser than a regular jumbo bobbin case to allow the heavy thread to feed through it and form stitches. Heavy threads in the red bobbin case thread in the usual way, into the slot and then into the wire guide. 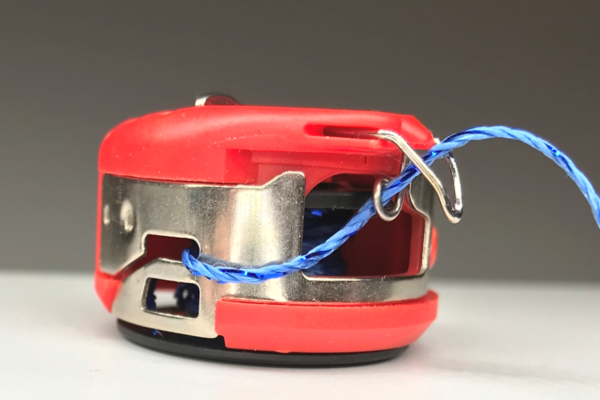 If using threads that are too large for the slot, flat ribbons or yarns, you bypass the slot and simply put it into the wire guide. 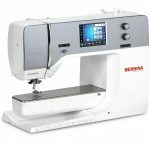 The BERNINA 880 requires a slight adjustment to the bobbin tension using the multi-function tool. Loosen the bobbin tension 2-4 clicks to the left. The presser foot that I like best for doing bobbinwork with the feed dog engaged is Open Embroidery Foot #20/20C/20D. It has a wide indentation on the sole that easily rides over the heavy threads. Plus, you can see the entire stitching area because of the open space between the two toes of the foot. Some stitches work better than others, so you will need to test several to see what you like. Open stitches work better than compact, satin stitches. The ones shown below are good choices but feel free to try any of them, remembering to increase the stitch length and adjust the bobbin tension as needed. The fabric needs to be firm and stable in order to support the heavy thread. Stiff, sturdy fabrics such as denim or canvas may not need any extra stabilization. Use interfacing, stabilizers, and/or batting on most fabric and place it on the wrong side of the fabric. Always test the stitch stitches before sewing on your project. 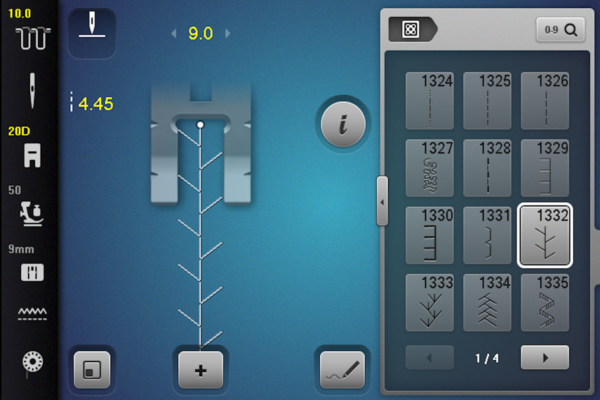 If you are following a pattern or design, draw it on the stabilizer. Remember to mirror image the design so it will be the correct orientation when the fabric is turned over to the right side. Select the desired stitch, increase the stitch width, length, and needle tension as needed. Go into the Settings Menu and turn off the Securing Functions feature. Using the handwheel, pull the bobbin thread up to the bed of the machine. You may need to tug on the thread a bit because it has to pull the heavy bobbin thread to the top. Pull about 5”-6” out the back of the presser foot. Tip: Instead of using the handwheel, press the Needle Up/Down button once to go down into the machine and a second time to come back up. This completes one stitch and will bring the bobbin thread up to the surface. Place the fabric wrong side up so you will be stitching on the stabilizer. Holding on to the thread tails, sew a line of stitches. 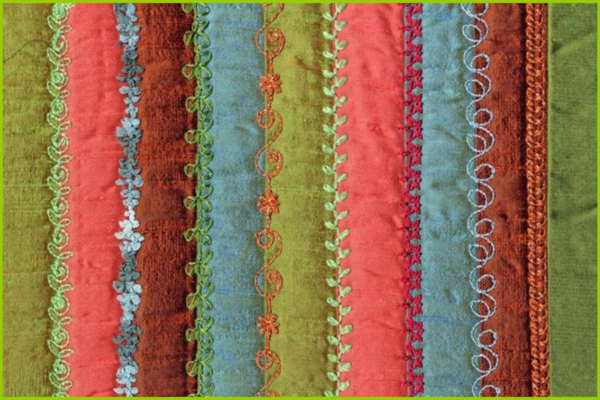 Turn the fabric over the right and inspect your stitches. 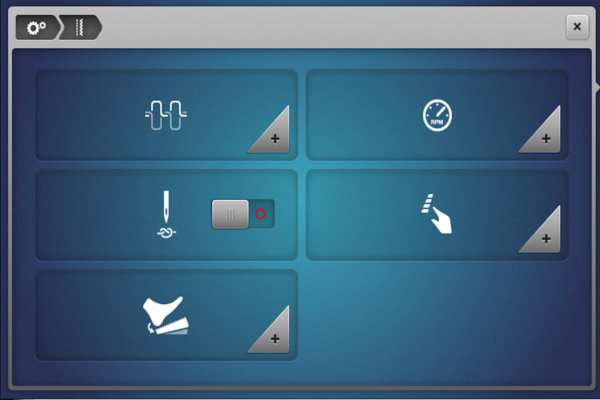 You decide how you want the stitch to look. If the needle thread shows on the right side of the fabric, tighten the needle tension until it is inconspicuous. If the stitches are stacked on top of each other, adjust to a longer stitch length. Continue adjusting and testing stitches as desired. When finished with a line of stitches, do not use the automatic cutter to trim the threads as they may be too heavy to trim easily. Trim with scissors, leaving a 5”-6” tail behind the foot. Use a hand tapestry needle to pull the thread tails to the wrong side of the work if needed. 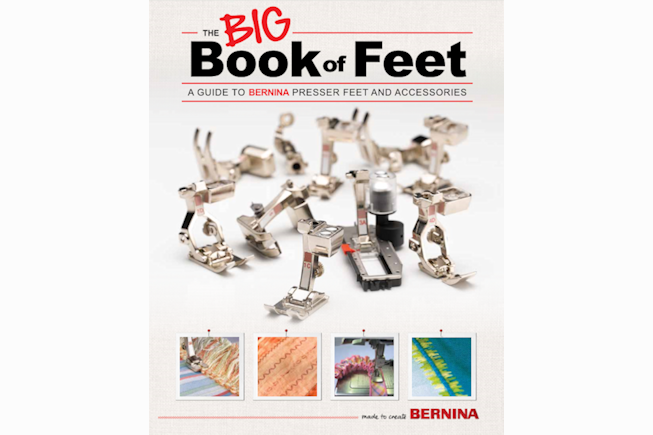 For more information about BERNINA presser feet and accessories, see The Big Book of Feet at your local BERNINA store. Thank you so much, Susan. I would have had no idea to put the thread through a hole. See you soon. I’ve heard that the red bobbin will work with the new 590. Please tell me it is true. So excited to try. Thanks!